Former Secretary of State Hillary Rodham Clinton had a pretty good gig — she got to filter Top Secret e-mails, Clinton Foundation work, and personal correspondences through a single server in her home in Chappaqua, New York. For months she tried to downplay the implications of her decision, but after the inspector general (IG) for U.S. intelligence agencies found out that top-secret information went through that server, she turned it over to the FBI. Her campaign’s response: “this kind of nonsense comes with the territory of running for president.” Seriously. The FBI transfer Wednesday occurred one day after a top intelligence official whose office has been reviewing some of Clinton’s e-mails informed congressional leaders that top-secret information had been contained in two e-mails that traveled across the server. The controversy over Clinton’s e-mail dates to the summer of 2014, when, according to government officials, State Department lawyers realized they didn’t have access to some of her records as they prepared responses to congressional requests related to the 2012 attacks on a U.S. compound in Benghazi, Libya. Imagine you were General David Petraeus, who was indicted, prosecuted, and ultimately convicted of sharing confidential information (i.e., the lowest level of classified materials). Imagine you were Sandy Berger, who was found guilty of stealing classified material out of the National Archives — he shoved them down his pants — to better protect Bill Clinton’s reputation after the September 11, 2001 terror attacks. Imagine you were Chelsea Manning, sitting in prison for the next three decades for leaking government files to WikiLeaks. Now imagine how you would feel if you watched the former Secretary of State get away with housing Top Secret information on her own personal e-mail server — completely out of reach of the federal government during her tenure with the Obama administration. You would feel pretty angry, wouldn’t you? This is not the “kind of nonsense” one must deal with when he or she runs for president. “Nonsense” would something along the lines of The New York Times reporting on Marco Rubio’s four speeding tickets — since 1997. “Nonsense” would be like The Times reporting that Marco Rubio might not make a good president because he acquired a lot of student loans on his way to becoming a Florida Senator. It is not “nonsense” when the FBI essentially says “Give us your person e-mail server before we make you give it to us” after finding out that it contained Top Secret information. Given that 10 percent of the emails in the small batch examined by the IG were classified, it’s more than likely that there are many, many more of the communications on that server are classified too. Clinton claimed that “there is no classified material,” but what we know is that there’s definitely some, and almost certainly quite a lot of it. A joint statement in July from IGs at the State Department and the Director of National Intelligence indicates otherwise. Only the most pathetic kind of partisan hack can look at this story and call it a non-issue or “nonsense.” In a best-case scenario for Mrs. Clinton, it shows that she thinks that the rules others have to live by do not apply to her or close associates. Rules are for “the little people.” And sadly, if her friends in high places make all of this go away, it will send a message to millions of Americans that, indeed, the so-called masterminds in Washington, D.C. can do just about anything they want and get away with it — if they know how to pull the right combination of strings at their disposal. If Americans want to know why Donald Trump’s campaign has traction, then they need to look no further than Mrs. Clinton’s email scandal. If Mrs. Clinton and her media allies convince enough Americans that the cloud of dishonesty over her head is really an angelic halo — and if her political allies in Washington, D.C., find a way to bury this controversy in a deep dark Memory Hole — then it will on many levels vindicate the Trump voter’s “Burning Down the House” mentality. 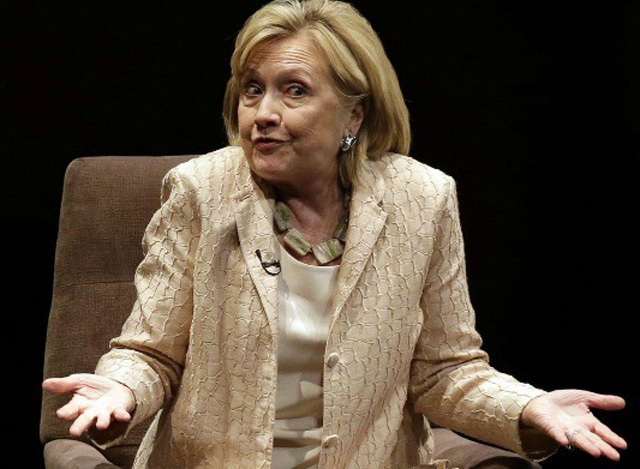 I know some stuff about classification, and someone asked me about Hillary’s server. I said, there was absolutely classified stuff on there, no question. There was high-level classified on there, no question. How could there not be? Everything a Secretary of State does is classified, or anything of consequence. What she did is like locking a bunch of classified documents in a safe at home. Nobody cares that your safe is pretty secure; it’s not an officially documented safe built to the proper standards for classified information and certified by the proper authorities. You’d go to jail, no matter how good your safe was, even if it was better than the real classified safes, because it has to be a properly certified safe with proper oversight in order to be an acceptable repository. I’ve heard of cases where government folks sent out a classified document accidentally — people’s work machines and phones had to be scrubbed to remove the classified data. The whole thing is absurd. She clearly broke the law and should defending herself unsuccessfully at trial by now. As you said, the government takes its classified information very seriously. Over the years I was able to meet some people in D.C. with some “interesting” jobs…and if they did what Hillary Clinton did, then they would probably be sitting in a prison cell right now. She should be the Donald Trump of the Democrat Party by now, if the Democrat Party had any standards left. People are saying that Trump is like Teflon, but Hillary Clinton has a lot in common with him. The difference between Mrs. Clinton and Mr. Trump is that Hillary has most of the media doing its best to save her from herself. I suppose the only good news is that even the Dems don’t like her much. Bernie Sanders wouldn’t be given the time of day in any other election cycle, and has become a semi-viable candidate…..even Hypothetical Biden is gaining on her in the polls. That being said, she will probably get the nomination; hopefully democratic apathy towards her causes many to stay home on election day, I can’t see her getting people excited like ’08 Obama did. I’ve been saying for years that not only will she not win, she won’t get the nomination. There’s a reason why an unknown beat her last time. She’s weak and nobody likes her, no matter how “inevitable” people keep saying she is. She’s like their McCain, except that their party is even more inclined to go for a new shiny thing than the Republicans are. I don’t think it’ll be Sanders. Where’s Elizabeth Warren these days? I was thinking she might end up overtaking Hillary due to not having to answer for her behavior and not having the pile of scandals to deal with. At any rate I still don’t think Hillary will be their nominee. It appears as though Elizabeth Warren has agreed to sit out this one. I wonder what sort of deal she struck with the DNC, the Clinton’s, etc. I think Biden should run. He’s another one who appears to be gaffe-proof. He could always make the case that he should be the guy to handle president Obama’s unfinished business. I can’t see her getting people excited like ’08 Obama did. She seems to know this as well. The more visible she becomes, the more people tend to dislike her as a candidate. Her book tour (where said millionaire complained about financial hardship) was a perfect example why she needs to stay away from unscripted moments. The better most people know her, the more they dislike her. She has served for years as chief enabler for the Predator-in-Chief, now claims to be a great champion for women. She is a poisonous relic of the 1970s.